As I write this, the painting of The Children of King Charles I is back at Government House in Wellington, in its rightful place in the Norrie State Dining Room. It is positioned directly in the eye-line of the Governor-General’s place at the dining table, and will quickly become part of Her Excellency’s experience of the House and her vice-regal role. The painting is beautiful. It glistens with life and colour. It remains true to the skill of those who made it almost four centuries ago. The painting is also a testament to the skill that you brought to its restoration. We can see that for ourselves. Something we do not see but know is also present, is your endurance with this project. We know it was not an easy thing, but something you were determined to complete to the most exacting standard. I thank you for all that you did to bring this painting back to its proper condition. Government House, now and in the future, extends its gratitude to you. Carolina’s conservation expertise, craftsmanship and attention to detail was apparent in all work undertaken which was to an excellent standard, and her willingness to discuss, consult, seek advice or share ideas was appreciated by the project team, myself as Conservation Architect, Heritage NZ and the Christchurch City Council Heritage Team. This is to let you know the paintings travelled well to Christchurch today with not a scratch on them! We unpacked them as soon as we arrived home. They are very beautiful and we will look forward to hanging them tomorrow. Once again, thank you for your care, passion and expertise. We are thrilled with what you have achieved. I am thrilled with the picture and the frame and pleased to see the original frame was incorporated… I would like to thank you and Maria for the wonderful work that was carried out on these and the pleasure they give us in our new home. We now have a “portrait gallery” of the ancestors!! Studio Carolina Izzo is a member of: New Zealand Conservators of Cultural Materials Pū Manaaki Kahurangi (NZCCM), Australian Institute for the Conservation of Cultural Material (AICCM), International Council on Monuments and Sites – New Zealand (ICOMOS-NZ), Museums Aotearoa, and A.Re.N. (Associazione Restauratori Napolitani). In the 2015 Interior Awards, Studio Carolina Izzo was the winner of the Craftsmanship Award. This New Zealand award is an acknowledgement of the importance of restoration and conservation of heritage interiors. This project reflected the ability to incorporate modern building standards and requirements into a heritage space. In the 2016 Canterbury Heritage Awards, Studio Carolina Izzo was highly commended for our Outstanding Contribution to Heritage. 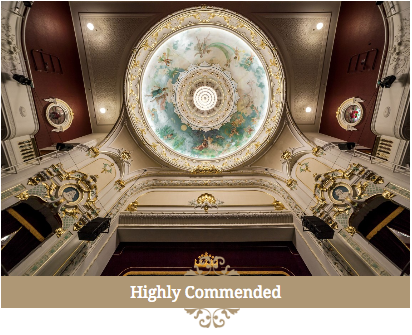 The complex, meticulous and intricate conservation and restoration of the Isaac Royal Theatre Dome, has future-proofed the feature for more generations to enjoy. In the 2016 Interior Awards, Studio Carolina Izzo was a finalist for the Craftsmanship Award, for gilding the ceiling at the new Bishop Selwyn Chapel at Holy Trinity Cathedral. The Craftsmanship Award went to Andrew Barrie Lab & Tezuka Architects for the Cathedral Grammar Junior School – Timber Structure, and we congratulate them. We were in good company for this award.